Newport County earned a battling point after falling two goals behind against visitors Northampton Town. Sam Hoskins put the visitors ahead when he pounced on a rebound off County goalkeeper Joe Day. 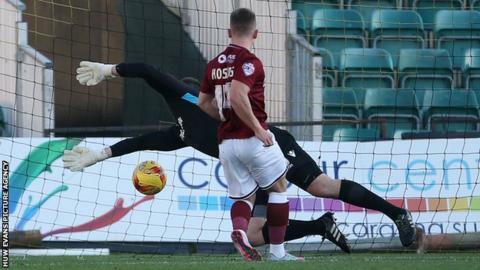 Marc Richards doubled the Cobblers' lead after Nicky Adams laid off a free-kick, but County replied immediately when Scott Barrow fired home a loose ball from just outside the area. Lenell John-Lewis then found the bottom corner to seal Newport's comeback. Newport manager John Sheridan told BBC Radio Wales: "The players know their jobs and what they're doing, and they're just giving me 100% each game, you could see that. "A couple of weeks ago they probably would have lost that game after going 2-0 down. "The goals are our fault, it's not good play from Northampton it's just silly errors... but I'd rather talk about the response I got from them." Northampton Town manager Chris Wilder speaks to BBC Radio Northampton following the 2-2 draw with Newport County. "I'm proud of the players the supporters after what has gone on this week. "It was a cagey game that could have gone either way. The main event is the survival of the football club. We hope that the right decision is made." Match ends, Newport County 2, Northampton Town 2. Second Half ends, Newport County 2, Northampton Town 2. Matt Partridge (Newport County) is shown the yellow card for a bad foul. Corner, Northampton Town. Conceded by Scott Bennett. Substitution, Newport County. Aaron Collins replaces Lenell John-Lewis. Zander Diamond (Northampton Town) wins a free kick in the defensive half. Foul by Darnell Furlong (Northampton Town). Substitution, Newport County. Yan Klukowski replaces Tommy O'Sullivan. Hand ball by Marc Richards (Northampton Town). Attempt missed. Marc Richards (Northampton Town) right footed shot from the left side of the six yard box is close, but misses to the left from a direct free kick. Attempt missed. Rod McDonald (Northampton Town) header from the centre of the box is close, but misses to the right following a corner. Jazzi Barnum-Bobb (Newport County) wins a free kick on the left wing. Attempt missed. Medy Elito (Newport County) left footed shot from the centre of the box is close, but misses to the left. Attempt missed. Tommy O'Sullivan (Newport County) left footed shot from outside the box misses to the left. Substitution, Northampton Town. Ryan Watson replaces Sam Hoskins. Scott Barrow (Newport County) is shown the yellow card for a bad foul. Darnell Furlong (Northampton Town) wins a free kick on the right wing. Foul by Scott Barrow (Newport County). Substitution, Northampton Town. Jason Taylor replaces Joel Byrom. Attempt saved. Lenell John-Lewis (Newport County) header from the centre of the box is saved in the centre of the goal. Substitution, Northampton Town. Alfie Potter replaces Dominic Calvert-Lewin. Foul by Jazzi Barnum-Bobb (Newport County). Corner, Newport County. Conceded by Nicky Adams. Attempt missed. Nicky Adams (Northampton Town) left footed shot from outside the box misses to the right. Second Half begins Newport County 2, Northampton Town 2. First Half ends, Newport County 2, Northampton Town 2. Corner, Newport County. Conceded by John-Joe O'Toole. Corner, Northampton Town. Conceded by Janoi Donacien. Goal! Newport County 2, Northampton Town 2. Lenell John-Lewis (Newport County) right footed shot from the left side of the box to the bottom right corner. Assisted by Scott Barrow.